The brother of Saint Martha and Saint Mary of Bethany. He was the man whom Jesus raised from the dead after having been dead and in his tomb for four days. The Bible does not trace his history after the miracle, but tradition says he became a missionary to Gaul, the first bishop of Marseilles, France, and a martyr in the persecutions of Domitian. Now a man was ill, Lazarus from Bethany,a the village of Mary and her sister Martha. Mary was the one who had anointed the Lord with perfumed oil and dried his feet with her hair; it was her brother Lazarus who was ill. So the sisters sent word to him, saying, "Master, the one you love is ill."
When Jesus heard this he said, "This illness is not to end in death, but is for the glory of God, that the Son of God may be glorified through it." Now Jesus loved Martha and her sister and Lazarus. So when he heard that he was ill, he remained for two days in the place where he was. Then after this he said to his disciples, "Let us go back to Judea." Jesus answered, "Are there not twelve hours in a day? If one walks during the day, he does not stumble, because he sees the light of this world. But if one walks at night, he stumbles, because the light is not in him." He said this, and then told them, "Our friend Lazarus is asleep, but I am going to awaken him." But Jesus was talking about his death, while they thought that he meant ordinary sleep. So then Jesus said to them clearly, "Lazarus has died. And I am glad for you that I was not there, that you may believe. Let us go to him." So Thomas, called Didymus, said to his fellow disciples, "Let us also go to die with him." 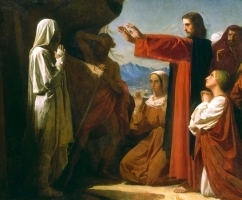 When Jesus arrived, he found that Lazarus had already been in the tomb for four days. Now Bethany was near Jerusalem, only about two miles away. And many of the Jews had come to Martha and Mary to comfort them about their brother. When Martha heard that Jesus was coming, she went to meet him; but Mary sat at home. Martha said to Jesus, "Lord, if you had been here, my brother would not have died. [But] even now I know that whatever you ask of God, God will give you." Jesus told her, "I am the resurrection and the life; whoever believes in me, even if he dies, will live, and everyone who lives and believes in me will never die. Do you believe this?" As soon as she heard this, she rose quickly and went to him. For Jesus had not yet come into the village, but was still where Martha had met him. So when the Jews who were with her in the house comforting her saw Mary get up quickly and go out, they followed her, presuming that she was going to the tomb to weep there. When Mary came to where Jesus was and saw him, she fell at his feet and said to him, "Lord, if you had been here, my brother would not have died." When Jesus saw her weeping and the Jews who had come with her weeping, he became perturbed and deeply troubled, and said, "Where have you laid him?" And Jesus wept. So the Jews said, "See how he loved him." But some of them said, "Could not the one who opened the eyes of the blind man have done something so that this man would not have died?" So Jesus, perturbed again, came to the tomb. It was a cave, and a stone lay across it. Jesus said, "Take away the stone." Martha, the dead man's sister, said to him, "Lord, by now there will be a stench; he has been dead for four days." So they took away the stone. And Jesus raised his eyes and said, "Father, I thank you for hearing me. I know that you always hear me; but because of the crowd here I have said this, that they may believe that you sent me." And when he had said this, he cried out in a loud voice, "Lazarus, come out!" Born to the Provencal nobility. Educated at Aix, France, then lived as a hermit at Faucon, France. Earned a doctorate in theology at Paris, France. Ordained in 1197. At the first Mass he celebrated, John received a vision of an angel clothed in white with a red and blue cross on his breast. The angel placed his hands on the heads of two slaves who knelt beside him. Later, when sitting beside a stream with fellow hermit, Saint Felix of Valois, the two were given the vision of a white stag between whose antlers was suspended a blue and red cross. With the encouragement of Pope Innocent III, he founded the Hospitaler Order of the Most Holy Trinity and of Captives (Trinitarians or Redemptionists) to ransom Christian prisoners of the Moors (the Mathurins). The congregation received papal approval in 1209. 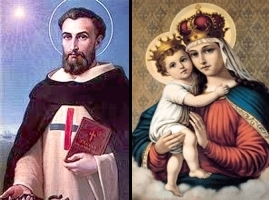 The clothing seen in the vision of the angel became the habit of the order, the Scapular of the Most Holy Trinity was instituted, the Order was placed under the protection of Mary under the title of Our Lady of Good Remedy, and John was the first superior general. Hundreds of prisoners were ransomed and returned to their homes. Because John's life contains such good story elements (visions, prisoners, rescued knights, etc. ), John became the topic for several biographies in the Middle Ages, many of these were loaded heavily with fiction. Today there are around 600 members of the Order working in prison ministries in over twenty countries, and they recently celebrated their 800 year anniversary. Born to a large and pious family. Dedicated to Our Lady at age 5 by his mother. Educated by the Piarist Fathers in Barbastro, Spain, and then in seminaries at Lleida and Urgell in Spain. Ordained on 9 April 1859. Private secretary to the bishop of Urgell. Seminary librarian. Chancery administrator. Secretary for pastoral visitations. Founded the Congregation of the Sons of the Holy Family in 1864. Founded the Missionary Daughters of the Holy Family of Nazareth in 1874. Both were dedicated to serving Christian family, teaching, and parish ministry, and today work throughout Europe, Africa, and the Americas. Founded schools and ministerial centers in several Spanish towns. Wrote books and pamphlets encouraging devotion to the Holy Family, to help the spiritual formation of the members of his congregations, to help families in trouble, and about school management. Founded the magazine La Sagrada Familia. Worked for the construction of a temple in Barcelona dedicated to the Holy Family, which was built by Servant of God Antonio Gaudí. 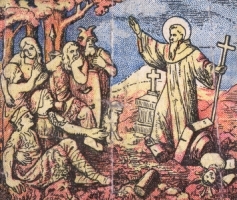 Educated by Saint Wigbert at Fritzlar Abbey under the direction of Saint Boniface. Friend of Charlemagne. Priest. Missionary in Westphalia for three years. Hermit at Hersfeld, where he tried to establish a monastery in 742, but had to flee ahead of Saxon raiders. Founded the Fulda monastery in 744, and served as its first abbot. He became the first German to become a Benedictine, and placed his house under the Benedictine Rule; it became a regional center for learning and spirituality. He became involved in a drawn-out dispute with bishop Saint Lull of Mainz, Germany about jurisdiction over the monastery, and in 763 Pepin banished Sturmi from Fulda. His brother monks rebelled, and persuaded Pepin to recall him after two years of exile. Sturmi evangelized the Saxons but met with little success as they associated him with the brutality of the rulers Charlemagne and Pepin. Orphaned at five months of age. Sold into slavery in Egypt as an adult, he converted his pagan "owner" to Christianity, and was promptly freed. He then withdrew from society to live as a hermit on Mount Sinai. Monk and then abbot of the Monastery of Saint Theodosius in Palestine. Tried to raise Greek troops to oppose the Persian invasion and destruction of Jerusalem in 614. Chosen Bishop and Greek Orthodox Patriarch of Jerusalem. Helped re-build the city after its conquest and damage by the Persians. 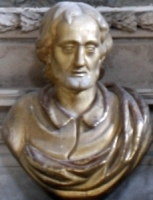 Son of the king of Domnonia, Brittany (in modern France). Brother of Saint Joducus. Well-loved king of Domnonia. Abdicated to become a monk, living his last 20 years in a monastery of Gael in Vannes, France. Born to a wealthy Constantinople noble family. Orphaned as a child. Married to Nebridius, prefect of Constantinople. Widowed, she refused several offers of marriage, and devoted herself to the Church. Deaconess. 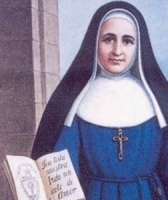 She led a non-cloistered group of prayerful women in her home, and devoted herself to charity. She built a hospital and orphanage, sheltered monks expelled from Nitria, and gave away so much of her wealth that her friend, Saint John Chrysostom, told her she was over-doing. In 404, due to her support of Saint John, she was persecuted, her community disbanded, her house seized and sold, and she spent the rest of her days in exile in Nicomedia. Born to the Irish nobility. Monk in Wales. Friend and evangelist with Saint Tudwal. Priest. He founded a monastery in Guingamp, Brittany, France, and served as its first abbot. Pilgrim to Rome. Founded the Congregation of the Daughters of Mary, Mother of the Church. She received many offers of marriage but turned them all down. At age 23 she became a hermitess near Brussels, Belgium. Her reputation soon attracted disciples. For them she built a Benedictine convent of Grand-Brigard on land donated by Count Godfrey of Brabant, and served as its first abbess. Brother of Saint Cadfan. Probably lived as a hermit. Several Welsh churches are named for him. Mercedarian tertiary and knight. Known as a man of great learning and personal piety. Led a Christian army into Algiers to oppose the Saracens. Martyr. Disciple of Saint Martin of Tours. Abbot. Founder of Our Lady of Cunault abbey in France. Daughter of the count of Vianden. Dominican nun against the fierce opposition of her father. Approximately 60 Christian soldiers in the imperial Roman army of emperor Heraclius; they were murdered as a group for their faith by invading Saracen Muslims. We know little more than the names of some of them - Abraham, Calaoicus, Ciriacus, Conón, Epifanius, Eugene, Florian, George (9 with this name), John (10 with this name), Marino, Marmises, Muselio, Paul (3 with this name), Paulino, Philoxenus, Photino, Stephen (2 with this name), Teodosio, Teopento, Theodore (5 with this name), Thomas and Zitas (2 with this name).